Earlier this week, my friend Jane asked if I'd be interested in taking some tickets off her friend's hands if she wasn't able to sell them. Of course, I was glad to, but her friend managed to sell them, so that was that. When I got home last night, Mr. Monkey informed us that we got free tickets to the concert from his company. Are we charmed or what? Rock Band Live. $0. In a suite -- the same suite where we had our private introduction to reggaeton! 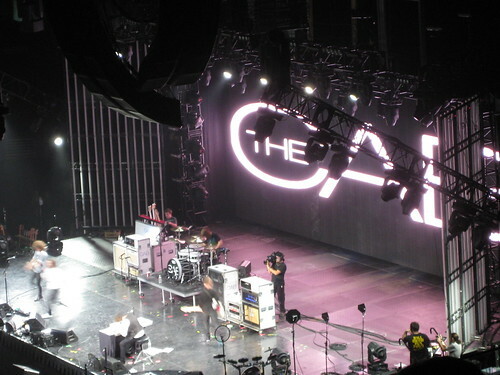 The first band was The Cab. Meh. Not even worth a video clip. Plain White T's performed next. They generally sound like a poor man's version of Fountains of Wayne singing as The Wonders in That Thing You Do! except FOW is far more creative with both melodies and lyrics. The hit "Hey There Delilah" is pretty different from the rest of their work. After Plain White T's, the first of several Rock Band geeks performed in between sets. These guys did a pretty swell Foo Fighters cover. I think they were the best of the bunch. 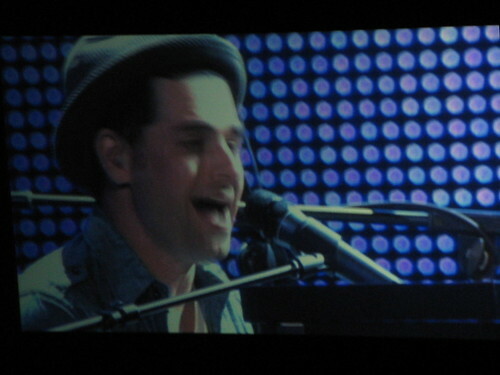 And then it was time for Chris to sing. Oh, Chris, I love you so. Recall that I saw Dashboard Confessional on back-to-back nights last October. My fave part of the night -- the cover of Weezer's "El Scorcho," of course! We stuck around for Panic at the Disco. Here's "I Write Sins Not Tragedies." And a great cover of "Shout." Nice finale. Nice free show. Woo hoo! Glad you still got to go for free! We should totally form our own rock band!!! We almost went to see Plain White T's but I was so unimpressed with all their songs but "Delilah" that we skipped out. <3 Dashboard. But honestly, WTF were they thinking w/the last album? I think the fame bubble is getting to Chris.